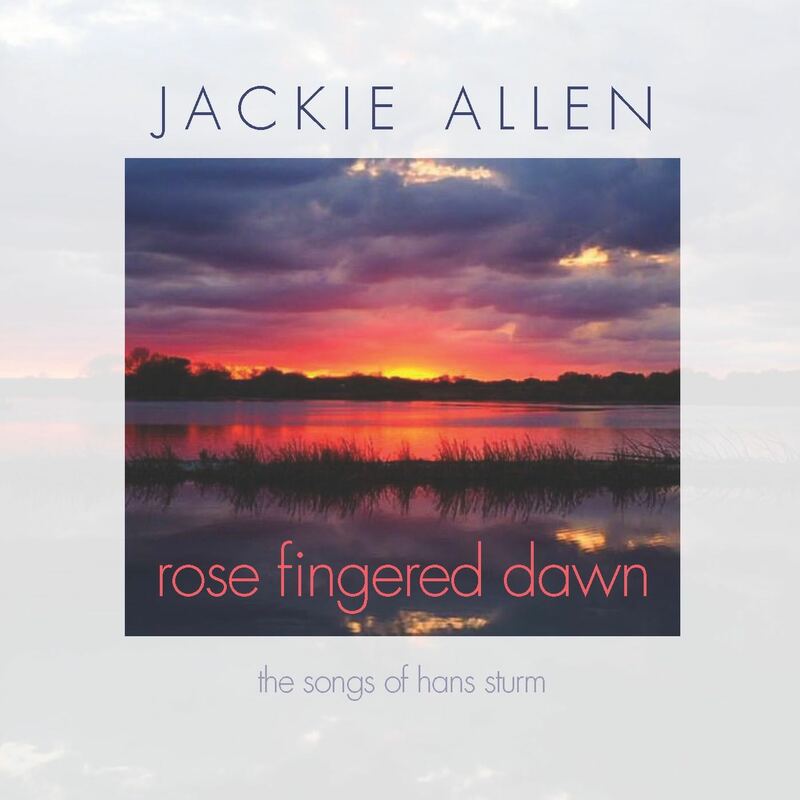 Allen’s alluring voice, in its natural vibrato, glimmers like gulps from the heart, yet she transmits lyrics and sentiments with effortless aplomb and exquisite timing. On “Moon on the Rising” her voice, in dramatic effect, speeds up the image to evoke the rising moon in a manner of seconds. On “Steal the Night,” her limpid phrasing sounds as if a circling well of water drifting into a slow current just out of reach of the departing lover who may never return. Dane Richeson is rather wizardly in adding dimensions of percussive impetus as layered as they are propulsive, revealing his long study in African percussion and world musics. His uncanny chants open the album, like a shaman preparing his followers for a sacred ritual. The album follows with due spiritual fervor and complexity. Bassist-composer Strum remains central to the experience at all times, like a great stone well around which followers circle in dance or huddle, dipping into its riches like hungry fishermen. Guitarist John Moulder also adds potent expression laced with shard-like textures, another veil of mystery that Allen dances behind. Try this singer out and you’ll fall hard. Return to her and you’ll know why you always do. 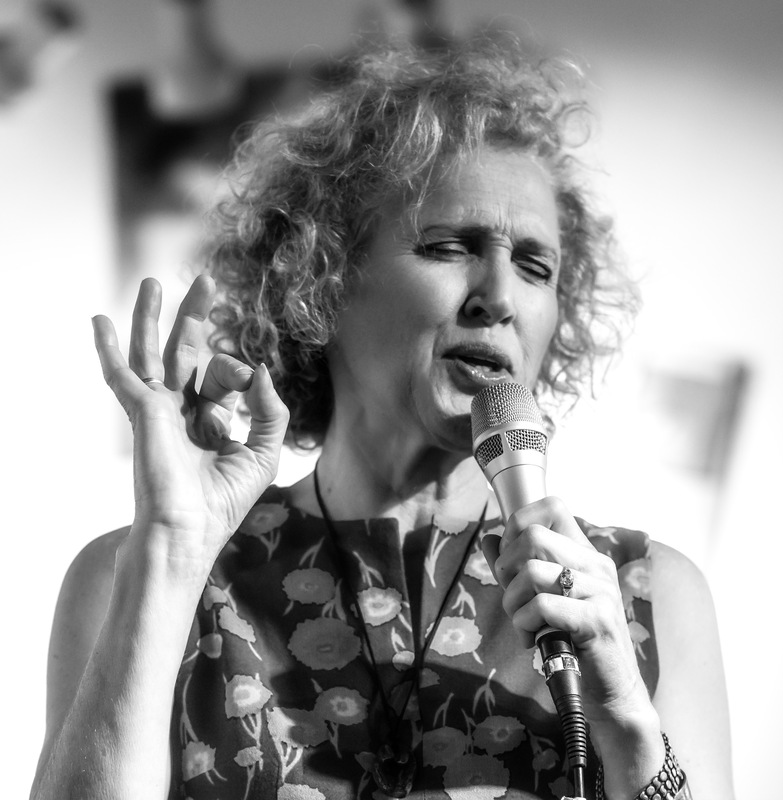 The black and white photos were taken by Leiko Napoli at Jackie Allen’s spring concert at the Jazz Gallery Center for the Arts in Milwaukee. The days may be dwindling down to a precious few, as the great jazz standard “September Song” informs us, but the fire of the trees signals that live jazz is just heating up in Milwaukee. 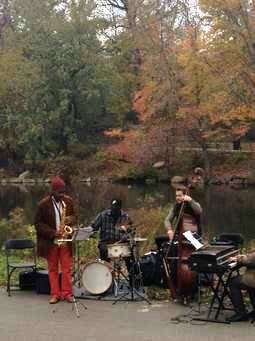 The first concert of late fall note seems a bit under the radar or perhaps obscured by fallen leaves. The Dave Stoler Quartet will perform tonight at 9 p.m. Several things make this event special but most of all that the featured member of the quartet will be tenor saxophone great Rich Perry, who himself lacks the recognition he deserves. This is partly because he has been a key member of important jazz orchestras as much as the leader of small ensembles. So, although Perry has made a series of acclaimed small combo recordings on the redoubtable straight-ahead jazz label Steeplechase since the mid-1990s, he made his mark in New York first with the great Thad Jones-Mel Lewis Orchestra, arguably the best modern big-band of the late 20th century. And today he shares lead tenor chores with the somewhat more high-profile Donny McCaslin in the 21st century’s preeminent jazz big band to date, the Grammy-winning Maria Schneider Orchestra. So Perry is a low-flying master of both high-flying straight-ahead swinging improv, as well as artfully orchestrated and even painterly playing, frequently demanded of players in the often magical-sounding tonal pallets of Schneider. 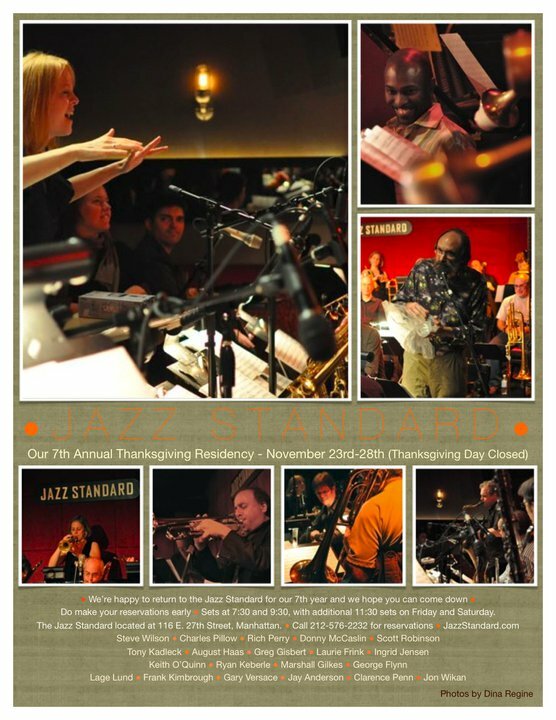 In this promotional poster on The Maria Schneider Orchestra’s Facebook page, tenor saxophonist Rich Perry solos with the Grammy-winning orchestra in the photograph on the lower right. Perry will be featured performer tonight at the jazz estate in Milwaukee with The Dave Stoler Quartet. Courtesy Maria Schneider Facebook page. One of the lesser known of Perry’s small-group recordings is as a side man with Madison pianist Dave Stoler on his excellent 1994 album Urban Legends which also includes tenor saxophonist Rick Margitza and the sterling rhythm section of bassist Ron McClure and drummer Billy Hart (the latter a member of Herbie Hancock’s iconic Mwandishi group). Stoler makes his home in Madison but periodically plays small group gigs in New York, and that recording reflects the sort of respect he commands among musicians in the know. Stoler himself has sounded like he’s been woodshedding extra hard in recent times and is playing at the absolute top of his game, as recent gigs have shown. Perhaps it’s an extra-hard focus on his plans for another recording, which probably will include Perry again. Along with Perry, Stoler’s quartet at the Jazz Estate will include his highly simpatico regular rhythm section of bassist Chuck Ledvina and perhaps Milwaukee’s preeminent jazz drummer, David Bayles. The Jazz Estate will remain a focal point of world-class jazz when The Tom Harrell Quartet performs two shows on Monday, October 30th. Harrell is consistently regarded among the finest trumpeters in modern jazz today and his skills as a composer remain in the highest echelon. He has written for full orchestras including his brilliant album Impressions which also drew from the classical Impressionist tradition of orchestration. 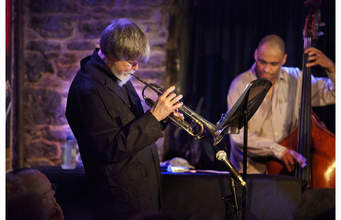 Trumpeter Tom Harrell. Courtesy Montreal Gazette. And yet the quintessential genius of the man himself may be best captured in a small group live recording, Tom Harrell: Live at the Village Vanguard from 2001. And that’s the sort of bag one should expect to hear him playing in at The Jazz Estate, although it’s hazardous to predict such things as this inventive musician seems forever full of surprises. 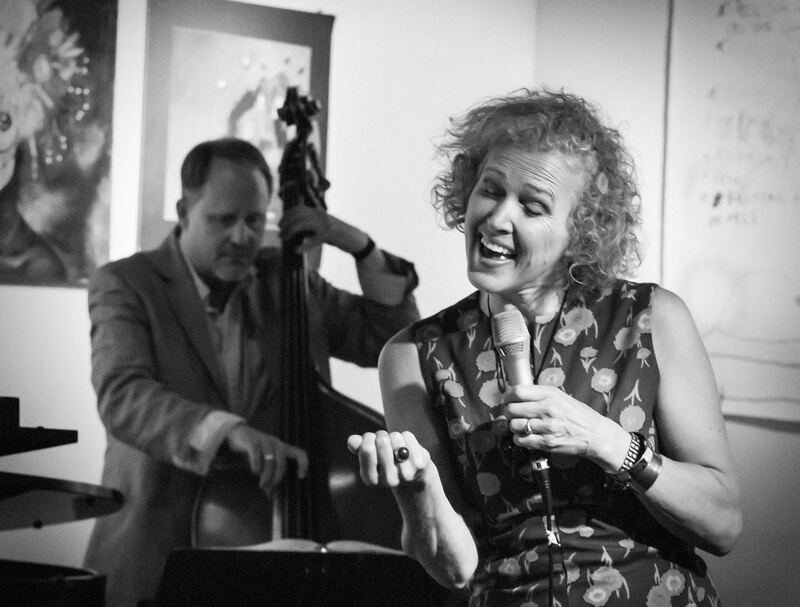 Harrell will perform with superb Milwaukee-based musicians, pianist Mark Davis, bassist Jeff Hamann (perhaps best known as the house bassist for the popular NPR program “Whaddya Know?”) and drummer George Fludas. I’m sure those musicians are boning up on charts for Harrell’s most recent High Note album, Moving Picture, which characteristically displays his ability to take the listener far beyond mere notes and chord changes and melodies to something that evokes life, beauty and truth, just as the oft- moving and multimedia magic of cinema can. The evidence of that recording shows once again that Harrell is an extraordinary master of lyricism, both in his distinctive ways of assembling tunes, and in how he thinks as a soloist – with lucid, deliberate articulation of shimmering and songful ideas. He can even pull this off at a fairly fast tempo. And he does this consistently as a prolific artist, with annual albums and not infrequently two, and sometimes three, recordings a year. Finally among upcoming fall offerings, keep in mind Saturday November 4, when the Milwaukee Jazz Orchestra and the UWM Jazz Ensemble kick-starts the 2017-2018 season with a dynamic concert celebrating the Milwaukee jazz tradition that was championed by Milwaukee native and jazz legend, Woody Herman. Thee Annual Woody Herman memorial concert will surely feature classic Herman material from the famous Milwaukee-native clarinetist and big band leader, who helped to bring the big band tradition into the modern jazz era. But the concerts will also be a great chance to hear music from the Milwaukee Jazz Orchestra’s recent recording Welcome to Swingsville! which invites you to an imaginary place populated not only by this orchestra but also the full spirit of unadulterated swing, which thrives there from dawn until ’round midnight, and beyond. The recording includes originals by leader and reed player Kurt Hanrahan and guitarist-composer Steve Lewandowski as well as classics by Juan Tizol and Duke Ellington, Frank Loesser and Charlie Parker with Gil Evans. So don’t let the mournful “September Song” and its accompanying season give you the deep-down blues. Better yet, transmute that bluesy spirit into a passion for a musical and brethren beauty, for live jazz, and go and get it. 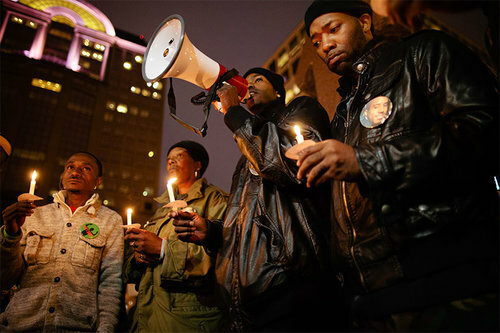 A candlelight vigil held in Red Arrow Park in Milwaukee for the late Dontre Hamilton, held by his family and other mourners and activists. Photo by Jennifer Johnson. It was a pleasant surprise to run into my former colleague, Madison-based writer and critic Rob Thomas, with whom I worked at The Capital Times for a number of years, before returning to my hometown of Milwaukee in 2009. I was also heartened that Rob cared enough to travel to Milwaukee to cover the film we were both attending, Blood is at the Doorstep. So I am offering a link to his excellent report on the film, which in its Milwaukee debut was a bonafide event, with a post-screening onstage talk-back with the film director in attendance as well as important members of the late Dontre Hamilton’s family, who provide much of the film’s soul and substance. As a fine film critic, Thomas is well aware that this film transcends, reaches beyond Milwaukee, while being an inextricable product of the city’s lacerated heart. As he points out in his article, Blood has already made waves throughout the country, having been shown at a number of film festivals including the prestigious SXSW film festival in Austin. It has also gained an independent distributor, and filmmaker Eric Ljung hopes it will have a continuing tour into 2018. I want to consider why this is important but I also want to focus on the film’s quality and effectiveness. The film has a conventional, straightforward linear narrative, like most documentaries. It details how a Milwaukee police officer, Christopher Manney, approached the sleeping African-American Dontre Hamilton, even though other officers had inspected him earlier in the day and determined he was a threat to no one. This tragic moment should never have happened for several other reasons. Manney’s record reveals that he amounted to more of a threat to the community than a safeguard. The film, three years in the making, reveals he had already been guilty of more than a dozen instances of excessive use of force, as well as a sexual assault charge. So in retrospect, it’s unsurprising that when Manney confronted the sleeping young black man, he put his hands on him. The groggy Hamilton reacted instinctively by grabbing Manney’s threatening billy club. A witness to the altercation says that neither Manney nor Hamilton landed a blow with the club. Nevertheless, Manney then pulled out his handgun and shot Hamilton 14 times, as he lay on the blanket he had been sleeping on. Talk about living and dying a nightmare. Later, district attorney John Chisholm says, in a tortured decision, he determined there was no criminal intent because, whether or not a blow was landed, the policeman’s club in Hamilton’s hand posed a threat. Thus, the district attorney’s reasoning is that somehow Manney was justified in his slaughter even though Hamilton never struck Manney. Objectively speaking, Chisholm should probably have not been ruling on this case because he works closely with MPD as public prosecutor. So he can hardly be judged a politically impartial investigator. This built-in conflict of interest in city justice systems is just beginning to be addressed across the nation, partly because of the preponderance of virtually all policemen being absolved of guilt in cold-blooded shootings of unarmed black men, time and time again. Another reason this never should’ve happened was the poor community relations that Milwaukee Police Department has with the people it is sworn to protect. A recent independent report has thoroughly documented this problem. So in this instance, we see police chief Ed Flynn, who comes off in the film as arrogant and self-serving, rolling his eyes and even ignoring the public as he sits before them at one hearing, while he stares at his cell phone. He says he was keeping track of a new murder case. If anyone needed Flynn’s consultation about that matter, one can assume they would have contacted him. Flynn also defensively profiled Hamilton as homeless and as an armed robber, neither of which was true. The dead man did suffer from a mental disease, perhaps schizophrenia. And it is clear that officer Manney failed to follow police department protocol in approaching a citizen. He ended up being fired for not following police procedure, but the department ignored the possible first-degree murder charge. This allowed Manney to appeal his firing as “wrongful.” Manney himself claims that he saw a bulge in a pants pocket of the sleeping Hamilton, which the cop said might have been a gun or a shard of broken glass that might be a potential weapon. No such weapon existed, merely Manney’s lame, lethal excuse. And because the district attorney absolved him of any responsibility for the man he killed, the officer ended up receiving 75% of his pay for the rest of his life, in effect living off the fat of city taxpayers as a retired officer only in his ’40s. Such miscarriages of justice inspired this film. Blood is also deeply stained with color, tone, texture, and a weave of a diverse group of people, from family to protesters to witnesses and police. It simmers with complex and heated emotions set against the tragedy’s backdrop of an unassumingly beautiful city (quiet as its kept). This hardly distracts from the heart of the film’s message – an urgent call for social justice and political activism in the face of system racism. But this film is not simply agitprop. Rather it radiates visually stunning artistic meaning and truth, more than most documentaries that don’t celebrate nature’s visual bounties. But the amalgam of human tragedy gives it a powerful pulse, brimming with passion, angst and contrastingly beautiful textures – cityscapes in a vivid array of luminous sky, atmosphere, light and grid patterns of intersecting streets. All that humanity has wrought here feels forsaken and besmirched each time we allow a citizen an unjust death. More pointedly and poignantly, Blood traces snow accumulating on the red sculpture that symbolizes the name of Red Arrow Park where Hamilton died, as months and then years pass after his death. Thick snowflakes fall on the arrow like tears, or melting hearts chilled by harshest realities that seem to defy hope. And yet here we see The Rev. Jessie Jackson, among those activists who attend the hearings and protest rallies, embodying his most famous words, to keep hope alive. Consider the irony now underlying the artwork’s glorification: These soldiers fought so hard to protect our freedom and democratic way of life. Dontre Hamilton slept beneath this sculpture when he was accosted and killed by a Milwaukee police officer. A federal civil rights lawsuit on his family’s behalf remains pending. 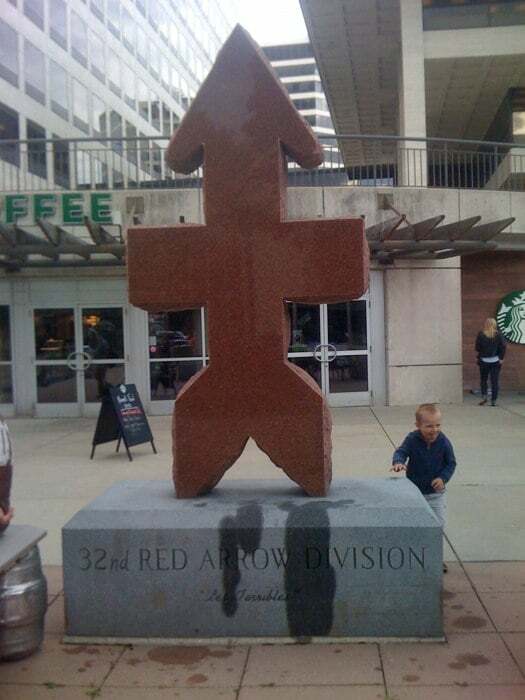 The arrow sculpture, also embodying the symbol of a cross, strains toward the heavens for deliverance and righteousness. Dontre Hamilton truly seems a kind of martyr, yet not unlike many other unarmed (or his case and that of 14-year-old Tamir Rice, “armed” with a toy gun) black males gunned to death by police. 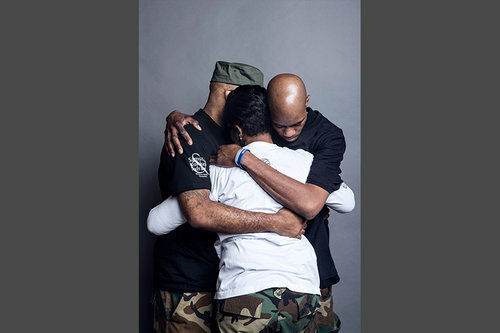 Today Hamilton’s family still feels shortchanged of full due process in their son’s killing. 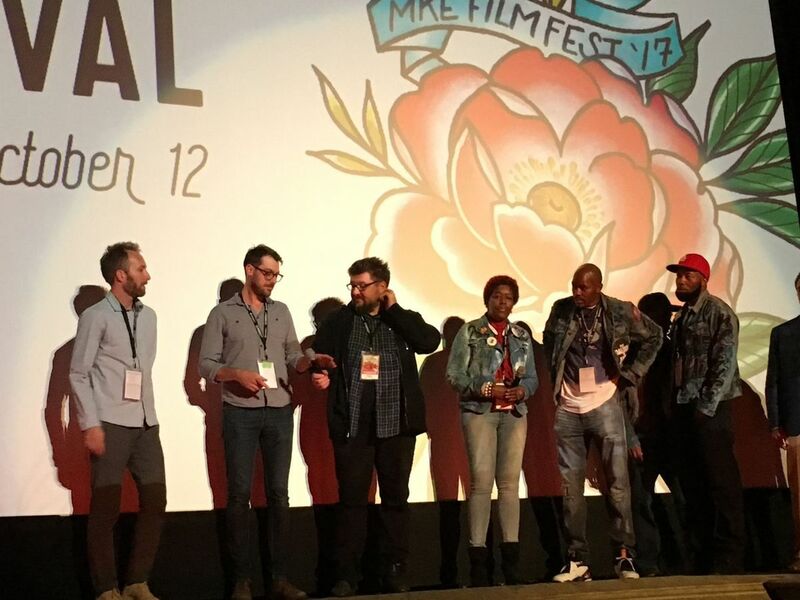 Among the most touching moments of the Milwaukee Film Festival event was Hamilton’s brother Nate, now a strong activist, presenting the film’s director Eric Ljung with a denim jacket festooned with graffiti-like spray paint decorations. (Left to right) “The Blood is at the Doorstep” director Eric Ljung, cinematographer Daniel Thomas Peters, editor Michael T. Vollman, and subjects Maria Hamilton, Nate Hamilton and Dameion Perkins speak at the Milwaukee premiere of the film Friday at the Oriental Theatre. 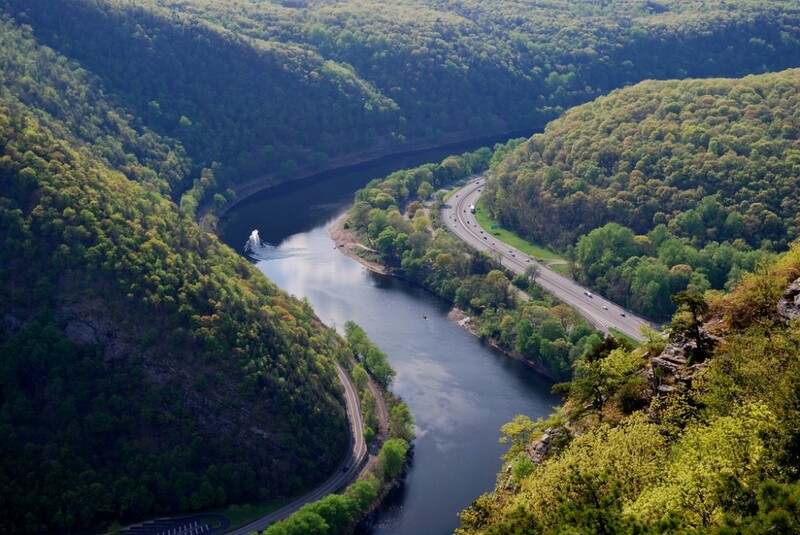 Photo by Rob Thomas of The Capital Times. Nate Hamilton read off the names of black men killed by police which were also hand-printed on the jacket. This brought to mind, for me, some celebrated artwork of African-Americans, “The Quilts of Gee’s Bend” which were shown in an exhibit in The Milwaukee Art Museum some years ago. Among the most striking works were patchworked quilts made of the denim work clothes of the women’s men, some who had died. Hamilton’s truly remarkable mother Maria, also at the screening, has lost one of her most precious men and now the humblest denim clothing has passed on to another man who turned her son’s story into art that must never be killed. And mother Maria is a sort of madonna who has doubtlessly imagined a final embrace of her dead son akin to Michelangelo’s The Pieta too many times, yet she also embraces passionate activism. Still, we see in the film, she has some inner, hard-won serenity that has her cajole overzealous activists for restraint when they seem to become counterproductive. At the film event Friday, Maria Hamilton appeared blessed with heavy but tearful joy, that her journey and quest continues, and that it may not be in vain.